Sorry! This Product has Been Discontinued! jARDCAN is the prefect prototyping system for Controller Area Network (CAN Bus) prototyping, plus the delivery includes the book "Controller Area Network Prototyping with Arduino," written by Wilfried Voss, a leading expert on CAN technologies. While the Arduino is not widely considered an industrial-strength solution, it provides, due to its low price and ease of programming, the perfect prototyping platform for all kinds of Controller Area Network (CAN) applications. This CAN Bus programming and development kit includes the Arduino Uno CPU board plus a CAN Bus Shield, and it is supported by sample programs as listed below. The book guides the reader through the process of acquiring all necessary hardware and software components, i.e. the jARDCAN system, the implementation of the CAN driver, and the implementation of programs (Arduino Sketches) to read, send, process, and display data from and to a CAN network.The collection of programming examples cumulates into a full-fledged USB-to-CAN Gateway communicating with a Windows/Linux PC. The book, in combination with the Arduino CAN Bus kit, will enable you to achieve CAN functionality literally within only a few hours. The following programming samples (accessible as .zip files) are free software; you can redistribute it and/or modify it under the terms of the GNU Lesser General Public License as published by the Free Software Foundation; either version 2.1 of the License, or (at your option) any later version. The samples are distributed in the hope that they will be useful, but WITHOUT ANY WARRANTY; without even the implied warranty of MERCHANTABILITY or FITNESS FOR A PARTICULAR PURPOSE. With downloading these programs, you confirm that these code samples and projects were created for demonstration and educational purpose only. 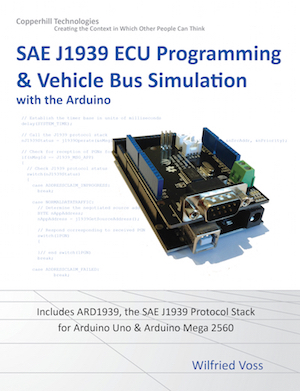 This book represents the perfect guide to implementing an SAE J1939 protocol stack for embedded systems. The book is filled with numerous C/C++ code examples and valuable documentation of the resulting J1939 vehicle network data traffic. It explains in great detail the inner workings of the protocol through designing and transmitting J1939 data frames, receiving and processing J1939 data frames, and simulating J1939 ECUs (Electronic Control Units). 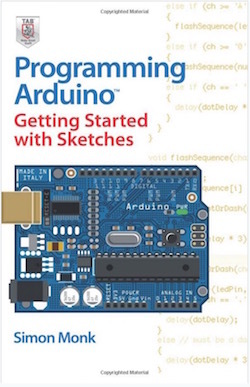 Other Arduino sketches (software projects) include a J1939 network scanner, and a simple SAE J1939 to USB Gateway application with associated Windows GUI (Visual Studio C# project). The collection of sketches is concluded by the ARD1939 project, a fully functional SAE J1939 protocol stack for the Arduino Uno and Mega 2560. Click the button below to add the CAN Bus Or SAE J1939 Development Kit With Arduino Uno to your wish list.